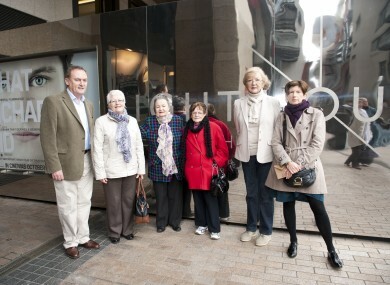 Ronan Tynan, Marian Finucane and Anne Daly with survivors of symphysiotomy outside the Lighthouse Cinema yesterday. IF YOU WERE wandering around Smithfield yesterday morning, you would be forgiven for thinking a Coffee and Cake morning had stumbled into the city centre. But the women who gathered – eating scones and drinking tea – at the Lighthouse Cinema do not have the local parish in common. It is something much more sinister. The limp is a common ailment in women who have suffered through symphysiotomies, a painful surgical procedure used in maternity hospitals across Ireland in the 20th century. Other problems include chronic back pain and incontinence. SOS continues to fight for justice, calling for recognition of the suffering they have gone through as a result of unnecessary procedures, and asking for compensation. The women, many of whom are in their 70s and 80s, want the statute of limitations waived so they can seek damages from the State. The request has received cross-party support in recent months but action has been slow. So slow, that many are preparing for a long-drawn out legal process. Between 100 and 150 survivors travelled to Dublin yesterday for the first screening of a documentary which examined the barbaric practice and compared it to methods used in Kenyan hospitals today. The women travelled from all over Ireland and overseas, each with their own stories. As Rita pointed out, there are plenty of limps but there are also canes and wheelchairs. Among the women – a lot of whom seem to know each other well – there are supportive husbands, sons, daughters and in some cases granddaughters. Many navigate the large, wooden staircase in a slow and careful manner but others seem grateful when an usher cries out directions to the lift. As we take our seats, a woman uses my chair to help herself up the short steps of the theatre. She is noticeably out of breath after three steps. She then bends down to tell me that she was “one of the original whistleblowers”, Matilda Behan. Broadcaster Marian Finucane introduces the film as “deeply shocking and moving”, while documentary maker Ronan Tynan tells the audience that he was more affected by the survivors’ stories than he was when meeting victims of other types of torture around the world. “We learned more about Ireland in Kenya than we set out to,” he explained. The makers of Mothers Against the Odds initially proposed to examine the experiences of pregnant women in Kenya but that “opened their eyes to the virtually hidden histories of a number of Irish mothers, who were forced to endure a level of cruelty, up to recent times, that was both shocking and incomprehensible”. Our experience in Kenya brought into sharp focus for us that very compelling story at home, which remains a very controversial and still unresolved part of our history. That history is slowing being uncovered by the women featured in the film. She discussed Catholic Church influence, and even interference, in maternity hospitals. Survivor Micheline Gilroy remembers being “held down” and a strange man looking annoyed at the end of her bed. “I thought this was the way,” she said. It was her first and only labour. Even though they now know they underwent symphysiotomies, there is still mystery and unanswered questions around the childbirth experiences of these women. The nurses looked sick, some even got physically sick, begins Nora Clarke. “I saw the hacksaw, I know what hacksaws are. He started cutting my bone and my blood spurted up like a fountain.” She remembers how the doctor looked annoyed that he had gotten her blood on his glasses. Until she spoke to her son Wayne about it many years later, Nora believed she had gone through a C-Section. “You’ll never get rid of [the pain] until you’re not living anymore,” she says during the film. After the screening, Gilroy told TheJournal.ie that she only had one child but everyone else in her family had big families and that she came from one herself. She believes something else happened to her during her childbirth. Lawyer for the Survivors of Symphysiotomy group Colm McGeehan notes that these procedures were carried out “in the age of the Beatles”. He calls it a “ghastly experiment” in the time of the European Union. As the documentary ends, there is a sense in the room that we are not finished. The women want to talk more. One puts up her hand to ask why more hospitals were not mentioned in the film. The practice, although most prevalent in Holles Street and Our Lady of Lourdes in Drogheda, also happened elsewhere. Just on a lesser scale. She tells the audience that she had a symphysiotomy in Loughlinstown Hospital in 1967. “I’m just wondering how many more hospitals did it happen in that we don’t know about,” she asks. Teresa Devoy then puts up her hand. Hers was in 1973. Kilkenny. Maria Kelly was a 20-year-old unmarried mother. Holles Street. Also 1973. Her daughter Barbara was 4lb. “To this day, I can’t figure it out,” she says. A year later, engaged and pregnant, she met her new doctor. His name? Michael Neary. He did exactly the same thing. One more symphysiotomy, multiple ‘repair jobs’, a divorce, an estranged family and a new partner later, Maria is still looking for answers and justice. Marian Martin is next. She tells the auditorium that she still has the receipt for the 28 shillings she paid to “book private” at Holles Street. The final word was given to Rita Doyle who underwent a symphysiotomy in 1960 when she was 22 years old. “I grew up with a really kind father. We had Jersey cows and if one of those cows was having a calf, he would be kind to her, loving to her. He would make sure she was comfortable and stay up all night with her. “So when I was pregnant and about to give birth, I was expecting kindness, understanding, love. A whisper of “butcher” is heard from behind her. Nobody can hear the stories without being shocked, says Rita McCann’s son Shane. All are appalled that this practice continued until 1984 and baffled that there has been no movement towards redress in 10 years. The women have won cross-party support – there were three TDs in attendance yesterday, including Caoimhghín Ó Caoláin who stayed until the end – but they are still calling for more action. Marie O’Connor, chairperson of SOS, describes symphysiotomy as “arguably the biggest human rights scandal in Ireland since the foundation of the State”. “Survivors have been seeking truth and justice for over a decade. Successive governments have stonewalled, forcing our members to resort to the courts. “These were covert, if not clandestine, operations – performed without consent – but taking a [legal] case over surgery done 50 years ago is fraught with difficulty. Setting aside the statute bar would enable all survivors to get their cases off the starting blocks, without being stymied by long running procedural battles. “The Chairperson of SOS emphasised that the law needed to change to allow all survivors ready access to the courts. ‘The government must now lift the statute bar. While many cases are being taken against private hospitals, all of these operations were done on the State’s watch. Mothers Against the Odds is a documentary film by Ronan Tynan and Anne Daly of Esperanza Productions. It examines the current experiences of Kenyan women as they go through childbirth, as well as the historic practices in Ireland’s maternity hospitals. Symphysiotomy was a surgical procedure used in the 20th century that involves unhinging the woman’s pelvis and widening it by up to 3.5 cm. It was often used in Ireland as an alternative to the Caesarean Section as it was believed to facilitate future births. The final symphysiotomy was performed in Our Ladies of Lourdes Hospital, Drogheda in 1984. Email “Symphysiotomy survivors gather to recount stories of torture”. Feedback on “Symphysiotomy survivors gather to recount stories of torture”.